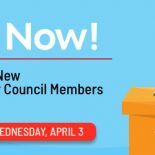 Staff, you have until 5 p.m. on Wednesday, April 3 to vote for new members of the Staff Advisory Council. The Staff Advisory Council is seeking nominations for new members! This year the council will be filling five seats as part of the nomination and election process. Do you have a question you would like answered at the spring President’s Update? Let the Staff Advisory Council bring your questions forward at the meeting! The Staff Speak Survey deadline is extended to Friday, February 15 at 5 p.m. Take 15 minutes to complete yours today! Help us reach full participation on the Staff Speak Survey. Your voice matters! The Staff Advisory Council is excited to offer another opportunity for you to engage directly with university leaders through our Town Hall series. Our spring 2019 Town Hall will feature Vice Provost for Student Affairs and Dean of Students Katie Stetz and members of the Student Affairs leadership team. Complete your Staff Speak Survey today! The survey is live through Friday, February 8 at 5 p.m. Attend an information session to learn more about the Staff Speak Survey and to ask questions about it before taking the survey. The Staff Advisory Council is excited to offer another opportunity in our Town Hall series for you to engage directly with university leaders on Thursday, July 19 from 1–3 p.m.
Paul V. Galvin Library has partnered with faculty at Illinois Tech to discuss open access in academic publishing.